Here is a link to the Pennsylvania Supreme Court of amendments to Pa.R.C.P. 212.3, 215 and 216, pertaining to pre-trial conferences and settlement conferences, which became effective January 15, 2011. "A court may require, pursuant to a court order, various parties to attend a pre-trial conference, including an insurance or similar representative, who has authority to negotiate and settle the case." The Rule goes onto state that, if the Pre-Trial Conference is set up without any Court order regarding the attendance of an insurance representative with settlement authority, such a person is still required by the terms of the Rule to attend the conference in person "or be promptly available by phone." 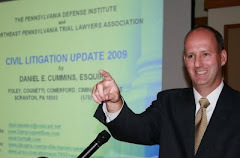 I send thanks to Attorney Dave Cole, Executive Director of the Pennsylvania Defense Institute, for bringing these Rule changes to my attention.